[Writer, reader, and friend Ed Erdelac contributes our last reader list of the week below]. 1. A Taste of Armageddon - I know this probably doesn't even make most people's top ten lists, but it's my all-time favorite. Kirk and Spock beam down to a planet to assess the civilization’s potential as a Federation member only to have the Enterprise declared a casualty of a centuries long computer simulated war fought with a nearby galactic neighbor. The crew is now expected to voluntarily report to local suicide booths. ANAN: Oh, no, quite real. An attack is mathematically launched. I lost my wife in the last attack. Our civilization lives. The people die, but our culture goes on. I know Spock is the face of Star Trek, but I've always been a big admirer of Kirk, and I think this exchange sums up everything I love about the character. KIRK: I'm not interested in discussing our differences. You don't seem to realize the risk you're taking. We don't make war with computers and herd the casualties into suicide stations. We make the real thing, Councilman. I could destroy this planet. ANAN: Why do you think I don't let you talk to your ship? 2. 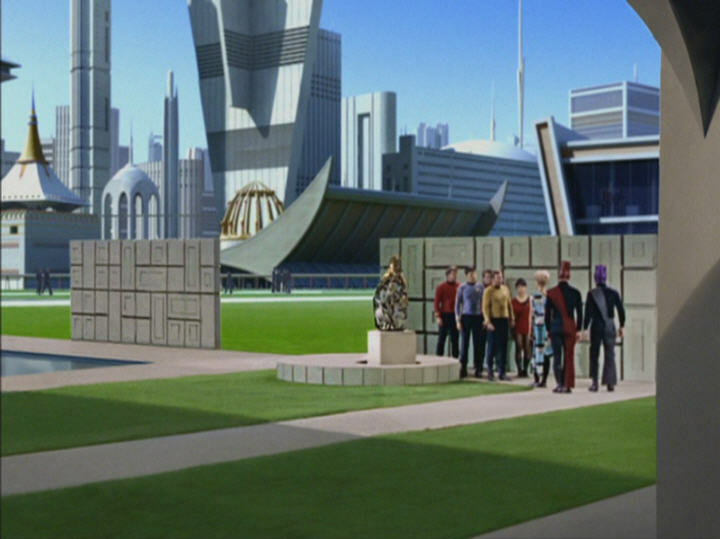 Arena – When I think of original Trek, I think of this episode. Kirk and The Gorn Captain locked in mortal combat in front of Vasquez Rocks. That awesome diamond bullet bamboo mortar. This episode arrested me as a kid. Yeah The Gorn seems slow and lumbering now, but back then, those scintillating insectoid eyes in that leering reptilian face, that deep voice, all terrified me. The ultimate moment, when Kirk has him dead to rights but spares him, that encapsulates everything great about the optimistic humanity of Trek - that even after relentlessly hunting down an enemy who has killed women and children, Kirk can show mercy enough to impress the enlightened Metrons. 3. The Devil In The Dark – Another great the-monster-is-not-what-it-seems episode, as in "The Corbomite Maneuver," but here the message is all the more poignant given the totally alien nature of the Horta. Spock sells the telepathy scene high, and my absolute favorite member of the triumvirate, Leonard ‘Bones’ McCoy, delivers one of the best ‘I’m a doctor not a’ lines (with bricklayer). 4. Charlie X – Mannnn this was a scurry one for me when I was a boy. The Enterprise takes on a volatile orphan (played fantastically by Robert Walker Jr, whose dad famously played the psycho Bruno Antony in Hitchcock’s ‘Strangers On A Train’) who makes inappropriate advances on Yeoman Rand and displays some unsettling powers. The most horrifying image in all of Trek is the woman whose face Charlie wishes to the cornfield when he perceives her laughing at him. I think only the crewman who gets phased between decks in the Next Generation episode ‘In Theory’ comes close. 6. Let That Be Your Last Battlefield – So this one gets a bad rap for its heavy handedness, with Batman’s The Riddler (Frank Gorshin) the last of a race of bi-colored humans hunting down the last of a neighboring race who on the surface looks completely alike to the rest of the crew, except their colors are reversed. The treatise on racism made a huge impression on me as a young kid, and given the state of the world, I wonder if maybe the simple binary color lesson depicted here might still be worth revisiting. 7. Amok Time – Spock needs to get married or the pon farr blood fever will destroy him, so Kirk takes the Enterprise to Vulcan. It’s our first look at Spock’s culture and home world, and the iconic duel music by Gerald Fried highlights the combat between Spock and Kirk perfectly. A classic episode. 8. Mirror Mirror – Kirk and the landing party experience another transporter foul up (is it any wonder McCoy hates that thing?) and wind up in an alternate universe where the Federation is sort of a continuation of Imperial Rome, all Kirk’s subordinates are out to kill him to advance their own ranks, and Spock has a beard. Barbara Luna as Marlena Moreau has got to be one of the loveliest actresses ever to grace a Trek episode and those alternate costumes really are spiffy. 9. Space Seed – The reason we have the best original Star Trek movie (and one of the finest sci fi adventure movies) ever made. Ricardo Montalban is the anti-Kirk from his hubris to his mannerisms, to his tendency to display man chest. Khan’s relationship with McGivers is problematic, but what of it? It’s still a kickass episode. 10. The Naked Time – The Enterprise picks up a bug from a research station that quickly starts driving everybody bonkers. My favorite bit character Lt. Kevin Thomas Riley (played with bravado by Bruce Hyde here and in The Conscience Of The King, sadly then never seen again) takes over engineering and croons ‘I’ll Take You Home Again Kathleen’ over the PA, Sulu goes full D’artagnan (My favorite exchange, between him and Uhura, when he calls her ‘fair maiden’ and she replies ‘Sorry, neither.’), and things generally go to pot. A fun episode. 11. 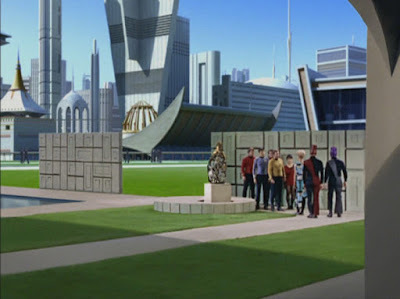 Journey To Babel – We meet Spock’s mom and dad, Amanda and Sarek, and we get a sense of the scope of the Trek universe when we’re quickly introduced to a slew of mainstay aliens (including my favorite, the Andorians) all munching on Play-Do cubes. Kirk foils a Romulan plot. There’s nothing not to like. 12. The Man Trap – An early, and welcome McCoy-centric episode, where the doctor has to choose between his heart and his brains. The salt vampire is a memorable critter (and shows up later as one of Trelane’s trophies in The Squire of Gothos), and I like the little exchange where it becomes a Swahili speaking crewman to entice Uhura. Neat little bit where Sulu is a botanist too, and his hand through a table alien plant reacts negatively to the disguised creature. 14. The Trouble With Tribbles – A bona fide classic. Humorous and some great character moments from Scotty, brawling with the Klingons not over any insult to his captain, but to the Enterprise. 15. Operation: Annihilate! – More mass insanity spread by parasitic lifeforms, but this time they claim the life of Kirk’s brother Sam. Shatner gives a performance that is more affecting when you realize his own father had only died a week prior to shooting in real life. The critters are nasty flying anchovy things, and Spock apparently sacrifices his eyesight for the crew, foreshadowing the ultimate sacrifice he will make in Wrath of Khan. 16. The Galilleo Seven – Spock, McCoy, Scotty, and some red shirts crash land in the shuttlecraft and Spock has to take command, the more desperate members of the away team mistaking his dispassionate decisions for a lack of basic empathy. Spock and McCoy shine. 17. The Squire of Gothos – A neat Twilight Zone-esque episode where the seemingly all-powerful alien baddie turns out to be a kid left a planet to play with. 18. A Piece Of The Action – Kirk and Co land on a planet of mimics who have based their society on a history book of gangland Chicago left behind by a previous Federation expedition. The premise is absurd, but it’s fun watching Kirk try to drive a Model A and everybody negotiate the old lingo. Plus, Scotty sets the Enterprise’s phasers to stun and STUNS A HUGE PORTION OF THE PLANET. Something that wisely never comes up again. 19. 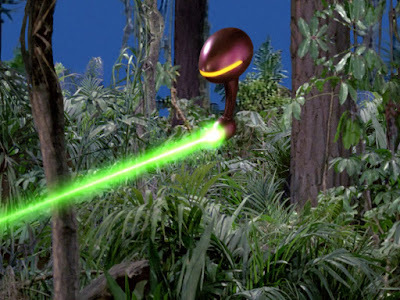 The Immunity Syndrome – I love this episode which is mainly a cheapo set piece with the Enterprise pursuing a giant planet eating amoeba, mainly because it’s fun to watch Kirk, Spock, and McCoy all outdo themselves in a bid to sacrifice themselves for the crew. 20. Whom The Gods Destroy – Kirk and Spock beam down to a model penal colony run by a doctor who alters the criminally insane a la Doc Savage, only to find the inmates have taken over the asylum. Just a cool little thriller-esque episode with Kirk trying to get the Enterprise to realize he’s a hostage while trying to sew dissent among his captors. Yvonne Craig is a knockout as a Harley Quinn-esque Orion prisoner.